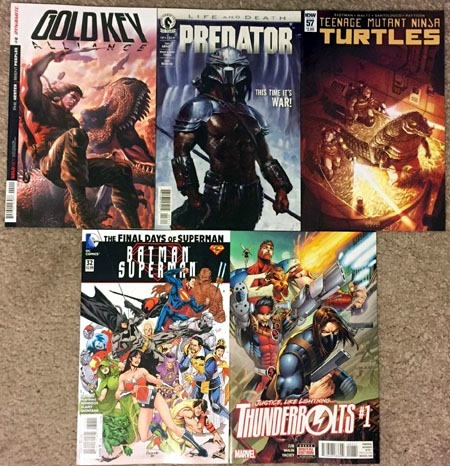 Outside of several pretty hefty recent book purchases, actual comics made for a big week this week…and probably my widest, most “diverse” (publisher-wise) such haul in ages! 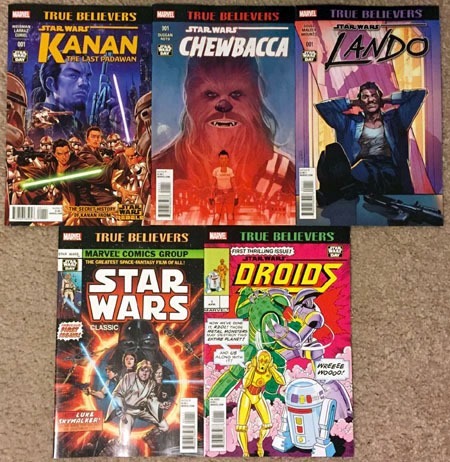 In my main/regular/new issues, I have five publishers represented. I was not going to buy the Thunerbolts issue…while I’d greatly enjoyed the late-1990s/early-2000s and somewhat tried again with the series with Marvel Now, I’d trailed off. Something about this cover, though, just REALLY triggers the nostalgia factor for me. While I’d prefer the title be at the top of the cover, for the image they went with, it works…sadly, I am certain this “main” cover is hardly the only cover…thus it lacks the iconic status of the original 1997 Thunderbolts book. I’d picked up the first two issues of X-Men ’92 recently to “check them out,” having bought the series last year with the Secret Wars stuff…seeing the third issue, I decided to take a chance and buy this one so I’m “caught up” for the reading. I’d been quite surprised that the first couple issues were “only” $3.99 apiece…that #1 was not $4.99 was a major selling point for me! 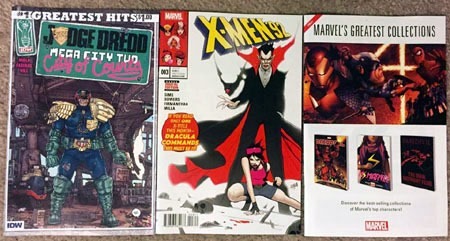 A $1 issue from IDW, and a catalog of Marvel collected volumes round out the “normal” stuff for the week. Which brings us to issues of timing, with their release falling on May 04. Star Wars Day seems to have become an official Thing, May 4th each year. 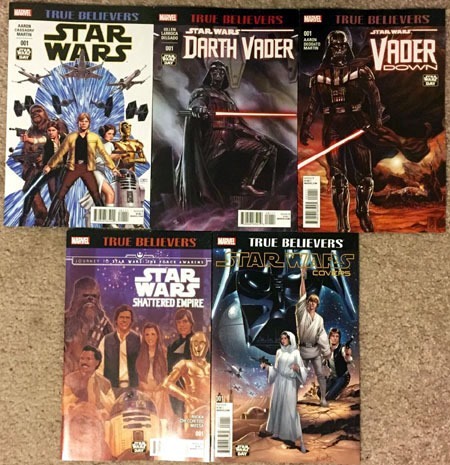 As in “May the Fourth be with you.” So rather than stagger them across the entire month…Marvel threw us ten $1 reprints of #1 issues. For the price, I’m cool with them; they were pulled for me as part of my “$1 and under promo-priced stuff” part of my pull-list. In addition, I snagged an extra copy of several issues to give to coworkers. I also hit the quarter-bins, where I snagged several random-ish issues. The Wolverine issue brings back definite memories from when it was originally released, so I grabbed that on the nostalgia alone. I snagged the Captain Marvel because it was #1, did not have the other issues in the bin, and I wanted an ‘even number” of books. 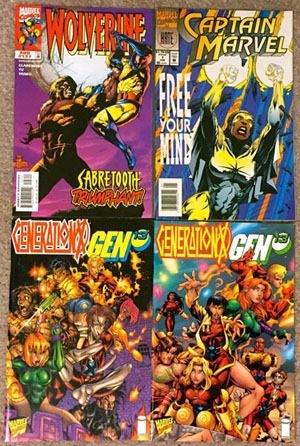 Turns out the Generation X/Gen13 books are variants of the same issue. I’m disgusted on principle but can’t be too upset…they’re wraparound covers, and I’m only out 50 cents for a double-length story. I totally forgot several weeks ago to follow up on an offer on the Guy Gardner issues–the store owner was planning on clearing them out “soon.” While I think I “missed out on” several early issues in the run, these issues are mostly what I recall being present at the time, so it all worked out in the end. I’m pretty sure somewhere in the Abyss that is my collection of longboxes I have the first 20+ issues–at least the bulk of the run before the book became Warrior…so I mostly passed on those for now, as I’m hoping to get the entirety of my comics collection sorted sooner than not…and I’m trying to exercise a bit of restraint in this regard (though adding 30 25-cent issues ($7.50) to an already cringe-inducingly large week on top of other expenditures may not be the most intelligent thing to do. There was a time that I figured I’d never be one to dig through back issue bins and multiple shops just looking for a random issue. 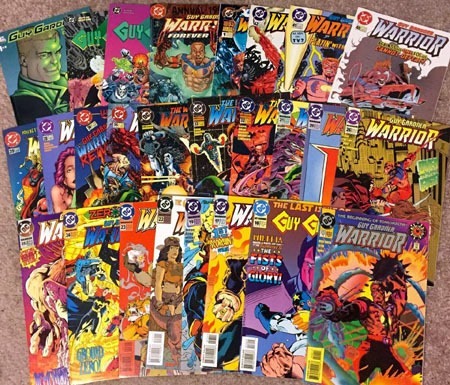 Years of great quarter-bin finds and other bargain-bin acquisitions had somewhat numbed me to the notion of paying more than $1 for any given ’90s comic, having come to see most as merely 25-cent fodder. More recently, I’ve specifically sought out an issue of Adventure Comics because of an ad for it in an issue of The New Adventures of Superboy. I bought a DC Comics Presents Annual due to some talk of the series on a podcast. I’ve sought out "random" issues of a couple other titles due to podcast discussions on them. I tracked down Green Lantern #81 for never having seen it in a quarter bin and wanting to finally read it. And so on. And really, it’s been awakening this suppressed "joy" of the search (and finding) of certain issues. Thus far, it’s been more success than not, and really is very enjoyable to go into a week with a specific issue of a specific series in mind, and with a single trip through a handful of shops I frequent, find that issue. No ordering online and paying shipping and waiting; just finding the issue, being quite agreeable to the asking price (and it’s right there on the issue, no taking it to a counter and someone looks it up in a "price guide" NOW THAT someone is actually interested in purchasing it). 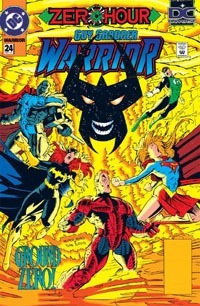 And in a post on his blog, covering the issue, Chris really piqued my interest in a Guy Gardner: Warrior issue the other day. If I already have the issue somewhere, I don’t recall it, and being intrigued, I went into a nearby shop over the weekend not truly expecting them to have the issue. 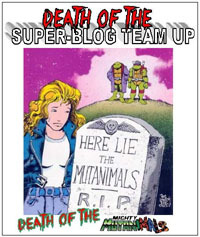 They had about half a dozen issues from the entire run…including this one, #29, that I was specifically interested in. And while I was thinking I’d prefer the newsstand cover, finding the "deluxe" "collector’s edition" for under $4 was quite pleasing. The price was all the more agreeable as it’s only 55 cents more than the cover price…and even adding in TAX, I only paid $3.75 for the issue. 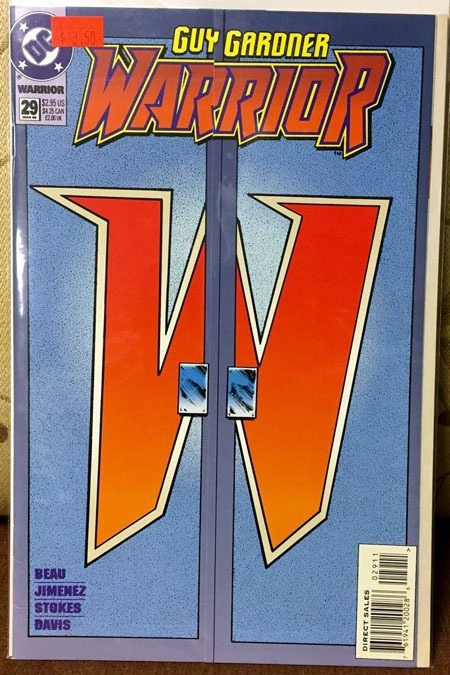 To put that into perspective: I had a specific issue of a specific series in mind, that was published more than two decades ago, with a typical-’90s "enhanced cover," and I was able to walk into a comic shop and buy it–bag and board included–with tax–for 25 cents LESS THAN a modern 20-page Marvel or DC comic. Instead of "just" "the latest issue" of something, I specifically sought this out, wanting it…and that wanting it, knowing it would NOT "just" be available at any/all comic shops on a rack prominently displayed…well, that just adds to the satisfaction of the purchase. Yeah, I may still hold to EXTREMELY RARE exceptions to not paying more than $10 for any given comic, period…but I’m certainly more thoroughly enjoying back issue hunting than I would have thought, and continue to find myself enjoying back issues much more than most any new comics Marvel or DC are currently publishing.